What if you didn’t have to wait every two weeks to receive a paycheck? What if you could be wired the money you earned almost immediately after a shift? What if, unlike with payday lenders, you didn’t have to pay interest on those payments? Instead, you were merely encouraged to donate a kind of tip to the company providing you with this service? That’s the proposition of Activehours, a four-year-old, Palo Alto, Ca.-based financial services startup that aims to turn the payroll process on its head — and which just raised $22 million in Series A funding toward that end, led by Matrix Partners. The company basically serves as kind of ATM, letting consumers who’ve accrued earnings pay for transactions like an unexpected car repair or an overdue bill without being charged onerous fees from their bank or a payday lender. It doesn’t charge interest, either, but rather invites people to provide it with a non-obligatory tip that they think is fair for the service. Activehours doesn’t take into consideration a person’s credit history. It doesn’t ask for a social security number. 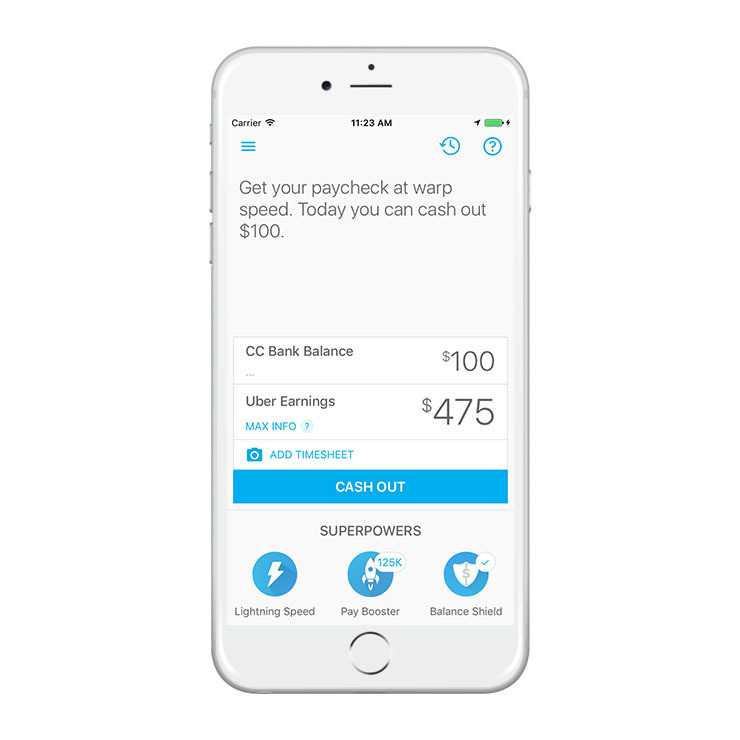 Anyone who has a checking account and a job can use the service, regardless of their employer, though Activehours has struck partnerships with companies, including Sears Holdings (which owns Sears and Kmart), to make it easier for its employees to access their accrued pay before their paychecks arrive. The company also also teamed up with Uber, whose drivers need only connect their bank information and Uber account information with Activehours in order to cash out after a shift. In another interesting twist, anyone on the platform can “tip” on behalf of someone else on the platform, an act that’s done entirely anonymously. Think of it like paying a toll booth operator for your own car, as well as for the car that’s behind you. But no fees? No interest? How can this possibly work as a business, especially as the company scales? Stalder says he asked himself the same thing when Activehours founder and CEO Ram Palaniappan first presented him with the idea. But he says users are indeed tipping — and they’re contributing enough that Activehours, which now services employees from more than 12,000 companies, can predict its revenue. “I definitely wondered if Ram could profitably run this business off tipping, and he has demonstrated in spades that you can,” says Stalder. It boils down to loyalty, he suggests. It’s not so unlike people who are given unlimited vacation time and thus tend to take less time off. Activehours won’t disclose what users tip on average, unfortunately. But the service certainly seems to make sense given the fast-changing nature of today’s work, where more people are are becoming independent contractors than ever before. Indeed, by 2020, 40 percent of America’s workforce will be freelancing, according to recent study by the software giant Intuit. Besides, Palaniappan argues, bi-weekly pay periods are a relic of old-fashioned bookkeeping systems that are no longer relevant now that money can be transferred digitally and checks are unnecessary. The outstanding question is whether the services are good for the people using them. What if there’s not enough money left at the end of a pay period to pay the rent, for example? Palaniappan says that Activehours helps its users with budgeting so they don’t fall into that trap; it also prevents them from drawing their entire paycheck, dollar for dollar, every day. More to the point, say Stalder and Palaniappan, people likely can and will gain greater control over their finances over the next decade, as workforces change and the world moves toward more micro transactions. And at the center of it all will be the mobile phone. Maybe they’re right. Activehours isn’t the only company tackling this apparent opportunity. Others include PayActiv and FlexWage, both of which work with employers to get staffers their pay more immediately. Either way, you can imagine that more people — many of whom are who are tired of being charged billions of dollars in overdraft charges each year — will begin trying out these new services out as they discover them. Other participants in Activehour’s newest round include March Capital Partners, as well as earlier backers Ribbit Capital, Felicis Ventures, and others. The company had previously raised $4.1 million in seed funding.